Seizure disorder bracelet or seizure disorder jewelry is probably the last thing on anybody's mind when dealing with a seizure disorder diagnosis. After all, bracelets, necklaces and anklets may not seem to serve any purpose beyond being decorative. However, when it comes to chronic diseases like seizure disorders, being quickly identified as having this medical condition is often necessary. This is why seizure disorder bracelets are often worn, not just to inform anyone about the wearer's health status, but to alert people, such as first responders, first-aid staff and medical professionals of the appropriate action to perform when the wearer is involved in an emergency. Seizure disorder is a medical condition that is characterized by recurrent seizures. Unfortunately, seizures in people suffering from seizure disorder are unpredictable and may occur at any time. The mildest seizures involve staring spells, while some people with seizure disorder suffer from violent shaking fits. Many people with seizure disorder take medication to keep seizures under control. Missed doses of seizure disorder medication may result in a seizure, leading to a medical emergency. When people with seizure disorder were first encouraged to wear seizure disorder bracelets, some people were not very supportive of getting "tagged" as having seizure disorder or as an epileptic. However, the fact that the bracelets were medical alert tags and could help in an emergency showed why it was a necessity. Seizure disorder is a serious condition, and it is important that those suffering from the condition are properly identified with a seizure disorder medical bracelet in case of an emergency. Because severe seizures could result in unconsciousness, seizure disorder ID bracelets are helpful for proper identification of the reason for the seizure. Medical professionals may waste time trying to diagnose the condition when the symptom is a part of a person's ongoing condition. A seizure disorder medical bracelet will alert medical professionals to the condition. 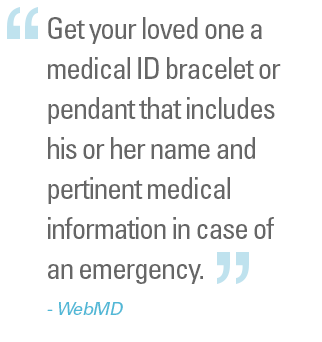 Information regarding a patient's primary doctor may also be included on the seizure disorder ID bracelet. Emergency medical personnel can contact the patient's doctor to receive detailed information about the type of seizures the patient suffers from, which will help rule out other complications. If medication is taken for seizures, this information can be noted on a seizure disorder medical bracelet. This will give medical professionals a better idea of what kind of seizures a patient typically has, and a dose of this medication may be administered to help stop seizures. Seizure disorder requires special medical care and attention. Often the person suffering from a seizure may not always be able to speak or communicate. He or she may even be completely unresponsive. Furthermore, an emergency may occur when a relative or a friend who has knowledge about the seizure disorder may not be around. In these cases, a seizure disorder bracelet can silently inform the attending medical personnel of the disease. Seizure disorder can be a difficult condition to have as you cannot always control your environment. So, on top of letting your loved ones know what they can do to help when seizure occurs, you should wear a seizure disorder bracelet. It should list important information such as an emergency contact and what a stranger could do to help in a public setting. It can be useful to include your name in a situation where you may not be able to talk. Having a seizure disorder bracelet will let the medical staff know how to make the appropriate medical decisions that can save your life. In case you’re in an accident, medical professionals will know what your likely medications are and what not to give you. Always ensure that you or your loved one is wearing a seizure disorder bracelet at all times and especially before leaving the house. If necessary, pack an extra bracelet during special trips, particularly if you will be traveling alone or leaving town for an extended period. Always wear the bracelet where it can be spotted easily and avoid taking it off. There are new styles to fit your personality and wearing it can mean the difference between living a healthy life and suffering serious medical consequences.